Pick your base – be it a Chapatti or herby bread (sliced in two) – and pack it with your favourite ingredients to make a filling and tasty Roll. A roll can be had as a snack any time of the day; it can be sliced nicely and garnished excitingly to make a starter; or wrapped in foil and stashed into your bag to enjoy on-the-go. Yes, Rolls symbolize convenience! 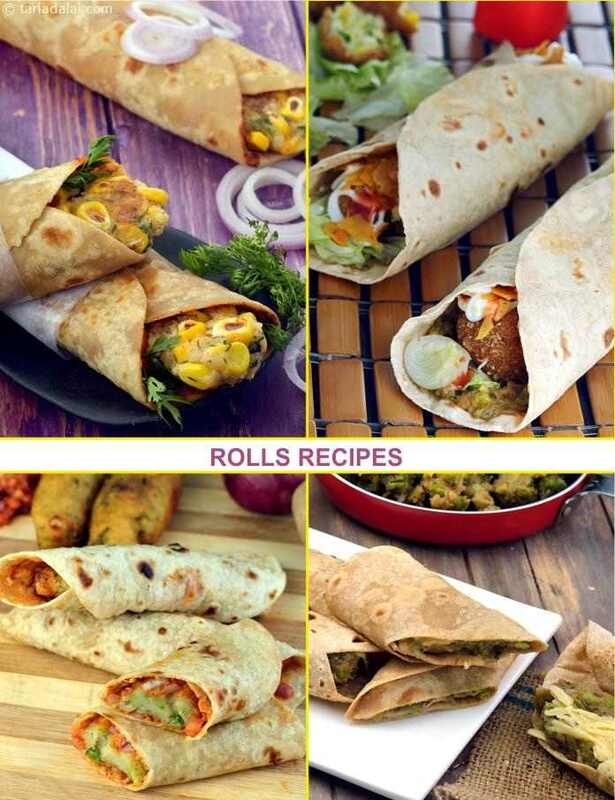 Wade through this section to find some of the world’s most exciting Rolls, ranging from the Achaari Aloo Roll and Paneer Tikka Kathi Roll to Mexican Kebab Roll and Potato and Corn Rolls. The versatility of paneer never ceases to amaze me! cooking the paneer in this lip-smacking marinade imparts a delicious feel to the wrap. The salads as well as the special garlic aioli sauce spread on the paneer make this worthy of a connoisseur’s attention. Bite into this delightful wrap prepared with exotic ingredients like asparagus and baby corn flavoured with oregano and chilli flakes, and forget yourself in the medley of flavours that challenge the exquisite cheese sauce! top it with lettuce, carrots and bean sprouts to add a nice crispy texture. Behold this yummy variation of egg bhurji! i’ve replaced egg with low-fat paneer and cooked it with assorted spices and veggies like tomatoes, spring onions and capsicum. The filling is therefore a powerhouse of vitamin c! wrapping it with soya rotis makes it rich in folic acid and iron too. An exquisite vegetarian variant of the famous hyderabadi shikampuri kebabs, these have been prepared with a fine blend of mashed vegetables, khoya and aromatic spices. Enticingly topped with makhani gravy, this kebab roll will make you feel like royalty.